There’s only so many hours in a day, so we need to use them wisely. From managing our time better by limiting distractions to having a system for storing our important data, we all have our own ways to being productive. For me being productive, either at home or at work, is to not be distracted so that I can accomplish the task at hand. And also to have a system in place so that I can easily record ideas that I have or retrieve them easily, not worrying about whether I have left them on a different computer. Below is a list of 5 tools for increasing productivity, both at home and at the workplace. RescueTime is a web-based time management and analytics tool for knowledge workers who want to be more efficient and productive. How many of us spend the day at work being distracted? It can be following that link which a friend emailed you and spending an hour at that website or constantly checking our social media website like twitter and facebook. And what about RSS readers and news websites, spending what could have been productive time reading up on all the news and articles. This is where RescueTime comes in. It shows you without remorse, the amount of time you had spent on each application and website on your computer, even tracking the time you spend away from the computer. To use RescueTime, you’ll need to sign up for an account with them. They have 3 plans on offer, one of which is free, while the other two are premium services. After signing up, you will need to download and install the application on your computer. Once installed, RescueTime sits in the background and measures which application, web site or (optionally) document is actively being used. What and when you track time is up to you. You can pause tracking, set up automated scheduling, or selectively delete tracked data. The website interface can show you a wide variety of reports and gives you a rich dashboard showing the data that’s important to you. See the top apps and sites for a week, see how email time ebbs and flows throughout the day, see which days of the week are you most productive, and see how you compare to the average RescueTime user. Everyone thinks they are more efficient than the average person but (obviously) half of us are wrong! Are you? RescueTime Focus Mode allows you to voluntarily block the distracting parts of the internet for a period of time you specify. RescueTime will enforce this focus– it’s a firm commitment. Sites are automatically categorized as distracting, but you have the power to re-categorize things if you need to. RescueTime is available for Windows, Macs and Linux! Getting Things Done (GTD) is an organizational method created by David Allen. It method rests on the principle that a person needs to move tasks out of the mind by recording them externally. That way, the mind is freed from the job of remembering everything that needs to be done, and can concentrate on actually performing those tasks. You can read more about GTD at Wikipedia. mGSD is an implementation of GTD. The great thing about mGSD is that it comes in two flavors. You can choose to download the application (essentially a html file) onto your computer, or you can choose to create a free account with them and use it on the web! This means you can access your GTD data from any computer which has internet access. Either at home or at work. And you can choose to password protect your GTD page so only you can access it. mGSD is supported on any computer which has a web browser. If your computer does not have access, you can instead download the application onto your computer and use it offline. This is especially useful when you work on two or more computers or devices. Such as a home computer and a work computer or a mobile device such as an iPhone, iPod or iPad. No more worrying about whether you have copied all you important files onto an external hard disk or USB drive, your data is automatically synced over all computers and devices. Any file you put into your Dropbox folder is automatically backed up to their servers. 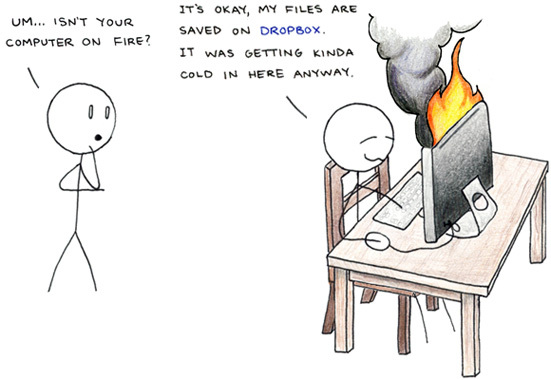 Even if your computer has a melt-down, your files are safe on Dropbox and can be restored at any time. Another way which I use dropbox is for file sharing with friends. I am a photographer and take lots of photos at family and social events with friends. Rather than emailing the photos to each of my friends I can just simply share a dropbox folder with them. It’s a lot quicker, more efficient and I don’t have to worry about whether I’ve exceeded the email message size limit. Dropbox comes free with 2GB worth of storage space with the option to purchase more space (up to 100GB). However you do earn bonus storage capacity by getting your friends to sign up with Dropbox (bonuses come in increments of 250MB). Sign up to Dropbox now or find out more at http://dropbox.com/. Use evernote to easily capture, organize and find notes fast! It allows you to capture anything, text, photos, web clipping and in some cases audio notes. The star feature for Evernote is that it does OCR (Optical Character Recognition) on your images so that you can search for it later! This can be a real time saver if you have many photos. Also with the Premium version, it allows you to search for text in PDF documents too. It works on both windows, macs and mobile devices such as Android and iPhones. Evernote comes in two flavors. There is the free version which gives you 40MB per month of uploads and there is the paid version of either $5/month or $45/year which gives you 500MB per month of uploads, priority OCR, better security features, support and no ads. MindMeister is a great brainstorming tool. Whenever I need to do some brainstorming on new ideas, this is what I turn to. The application layout and functionality are very intuitive and easy to use. Once you are done with the mindmap, you can share it with your friends or publish it to the world. The application comes in three flavors, Basic (Free), Premium and Business. I’m currently using the free version, so I can’t comment about the extra features that come with the premium version. But the main draw-back with the free version is that it allows up to only 3 mind maps. I get around this by simply exporting the mind map to PDF or to the MindMeister’s format. Do you have a productivity tool that you currently use which is working really well for you? Share it in the comments! Evernote looks good. So thanks for the info. An alternative to mindmeister which I use is xmind. It’s a freeware app/prog so you can always work offline (I use the package for drawing large org charts and work alot on the move) and can be run on all platforms. You can also share maps online. The pro version makes for easier exporting and private sharing.